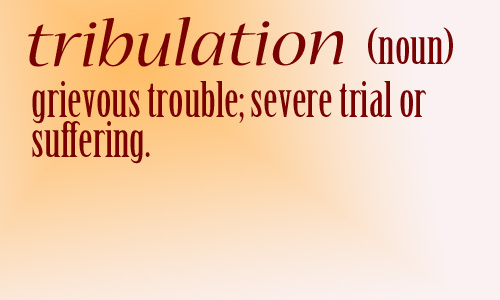 Most of us have heard the phrase “trials and tribulations.” But have you ever looked up the meaning of tribulation? I think it’s one of those words we all know, and basically know the meaning of, but have never bothered to confirm. It is more than heartache; it’s more than the car breaking down; it’s more than anything that falls within the realm of a crappy day. Tribulation is above and beyond agony and suffering, such that it earns a spot on this list. All that said, tribulations or “severe trials and suffering”, like most things, are relative. Those of us in the developed world, who are used to things like—oh, I don’t know—potable water are wimps in comparison to the billions living with much less. That doesn’t diminish our suffering, though, because the expectation is higher. I think suffering is based on expectation and circumstance. The city I live in faced a water crisis over the summer that made international news as a toxic algal bloom made our water undrinkable. For me, it was a minor inconvenience. I am healthy, so I still showered in the water, and i just went to my parents’ house and filled some jugs. For others, who don’t have parents who live in the next county over or didn’t have the money to buy three days worth of water or who weren’t healthy, the event was more difficult. My expectation was to turn on my tap and drink. I couldn’t. But my circumstance allowed me to use “the disaster” as an excuse for day trips. The water crisis was more of a tribulation (though I don’t know if it really qualifies) for those in other circumstances, who like me, expected drinkable water to come from the tap, but had no easy access to a replacement.